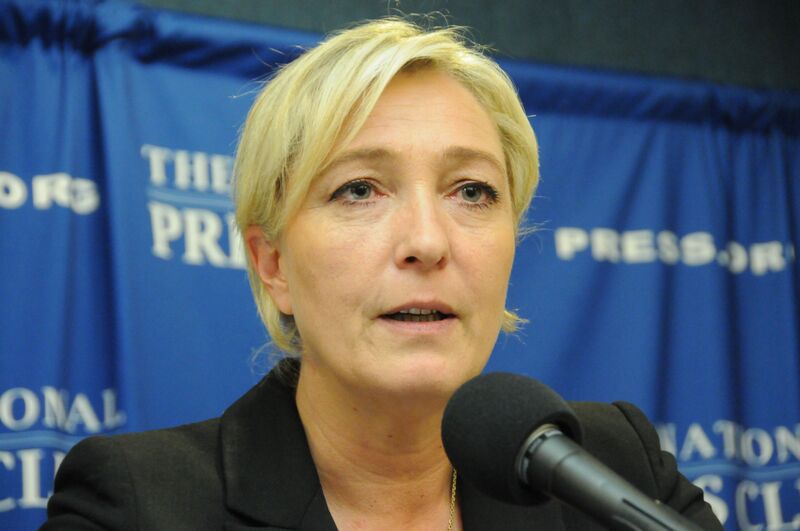 A member the European Parliament and the leader of the Front National (FN) Party in France, she said the euro “is producing poverty, unemployment, de-industrialization, an explosion of inequality and everywhere, despair.” She called also for France to withdraw from Libya, and curtail immigration. I helped arranged the talk, and we are shown at left shortly before her Press Club speech. Her U.S. senior strategic advisor, Guido Lombardi, is in the photo by his daughter, Lejia, who also took the photo below left. Shortly afterward the room filled with about 50 journalists, including a half dozen television crews. Le Pen is an attorney and the youngest daughter of the French politician Jean-Marie Le Pen, former president of the FN and currently its honorary chairman. Her aim is to expand the political influence of the FN and transform it into what she calls a "big popular party that addresses itself not only to the electorate on the right but to all the French people." Also, Le Pen urged return of what she called "reasonable protectionism" to foster higher standards of living and "conditions of economic and social progress and development." She said the decision of Greek Prime Minister George Papandreou to hold a referendum (since reversed) was highly unexpected since European bankers did not want the Greek people decide on their own future. Responding to a question by newsletter publisher and commentator Wayne Madsen about whether she favors pulling France out of the military structure of NATO and restore the policies of President Charles de Gaulle, Le Pen seemed to say through her translator that she wanted France to pull out of NATO. Several reporters noticeably stirred. Later, I doubled-checked with her and the translator, and they said she meant to say France should leave Libya, not NATO. 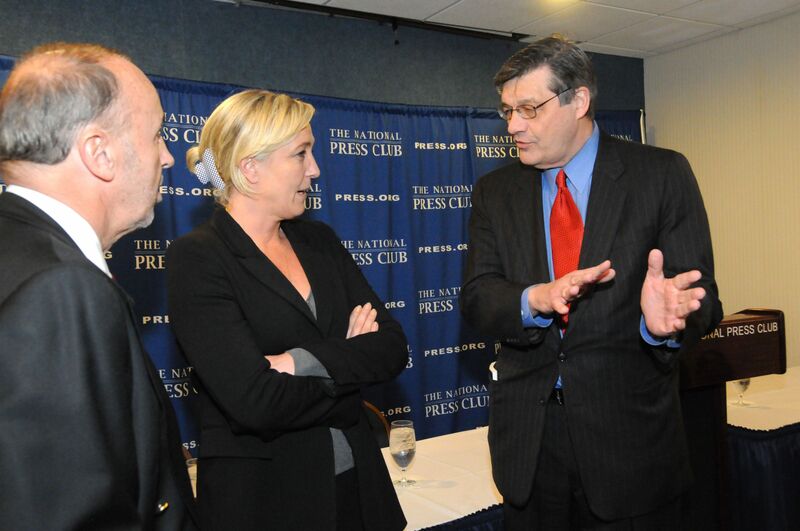 On Nov. 3, Le Pen met in New York with UN diplomats (including Israel's ambassador to the United States, Occupy Wall Street protesters and the local chapter of a the Republican Women's National Federation. In sum, her trip was intended to meet both well-disposed conservative sympathizers and broaden her reach to include people and positions not normally part of a conservative movement. 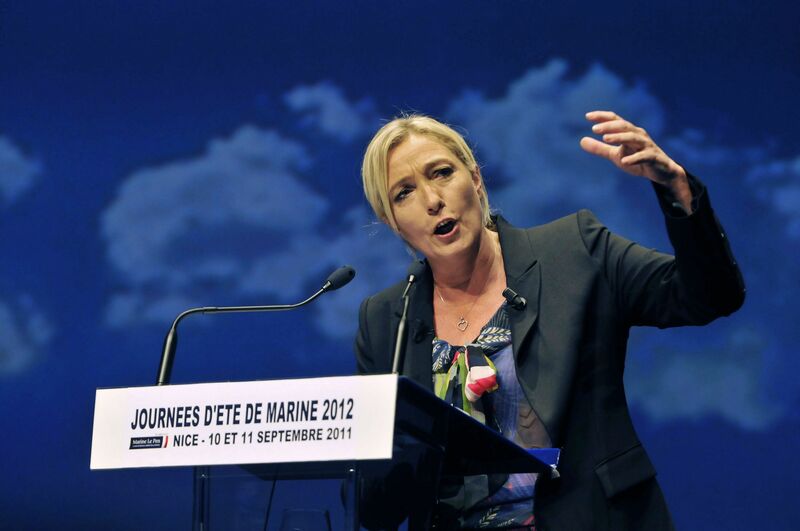 In September, she outlined her themes as, "The voice of people, the spirit of France" in Nice. During her closing speech, she addressed her solutions to immigration, security, the economy and the need for what she called a 'strong state.' Additional background is in a United Kingdom newspaper report here, which showed her leading all candidates narrowly in a poll with all leaders receiving support in the low 20s. The three leaders, including incumbent President Sarkozy, were grouped within the poll's margin of error. More background is in a National Public Radio profile here.